Is E-ZPass Tracking You Right Now? Do you know where you were at 5 p.m. last Monday? Your E-ZPass does. If you value your privacy, read on; your E-ZPass may be used to spy on you. New York traffic agencies are tracking motorists across the state by connecting to their toll tags mounted to their windshields, even when the drivers are nowhere near a toll booth. Sounds similar to usage-based insurance that’s becoming more popular with car insurance companies. Both the New York City Department of Transportation and Transcom, a traffic management agency, admitted that for nearly 20 years they have been using antennas to connect to E-ZPass toll tags in vehicles driving across more than 3,000 miles of public, non-toll roads, in New York, New Jersey and Pennsylvania. A news reporter from Bergen County was invited on a drive to see firsthand proof about the secretive program by a privacy supporter who discovered the extent of the program after he created a device that alerted him every time his toll tag was pinged by an antenna and being scanned. 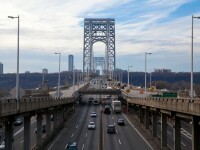 Their drive took them on the feeder roads surrounding the George Washington Bridge including Routes 46 and 4 in Fort Lee and up the northbound side of the Palisades Parkway. The results were startling – his E-ZPass tag was being actively scanned and there wasn’t a toll booth in sight. Funny, the E-ZPass terms and conditions, found on the agency’s website, don’t say anything about tracking motorists. Reportedly, permission to use the E-ZPass tags for traffic management was based on strict privacy controls and guarantees of anonymity. The agency states the tag’s identities are scrambled and the travel times they obtain are based on aggregations of vehicles from reader to reader. Those promises don’t sit well with Donna Lieberman, executive director of the New York Civil Liberties Union (NYCLU). She believes the system is a target for abuse, and if we are not doing anything suspicious, our travels are no one’s business. The NYCLU has formally demanded information from the Department of Transportation for both New York state and New York City, on how E-ZPass readers are used to track and record residents’ whereabouts. Whether the E-ZPass information is being used for marketing activities or political surveillance, New Yorkers have a right to know what’s the purpose. If you do want to keep your movements away from Big Brother’s prying eyes without completely going underground, there’s a quick fix – just use the special storage bag provided by E-ZPass with your tag. When your tag is stored in the bag, it can’t be tracked. When you’re at the tolls, just take it out. However, this brings up another issue – if they have both the toll data and the other data, they know you’re masking your travel information – does this now make you a ‘person of interest’? The goal of greater security through wide-scale surveillance may be a trade-off without any public scrutiny, or any checks and balances to keep tabs on abuse. So, while using your E-ZPass may free up your time waiting in traffic, it may also free up personal information you have no control over. From marketers to car insurance companies, your information could be up for grabs. Do you think the NYCLU is overreacting? Feel free to share your thoughts in the comments section below.